Mmmm I am always on the look out for food intolerance friendly cereals. So when I spied this Rude Health Porridge on offer I had to give it a try. 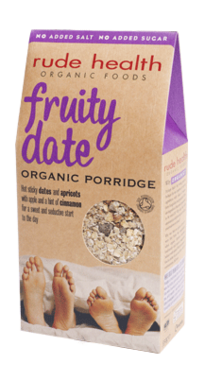 There are 4 different varieties but I went for the fruity date organic porridge. I love porridge and although its a bit pricey its packed pull of flavour and makes a nice tasty porridge treat. If you want to make it last longer I added 50% more oats to bulk it out and spread the flavours. So next time you see rude health porridge pick up an packet and give it a try. If you try the other flavors let us know. Where would i find this porridge?